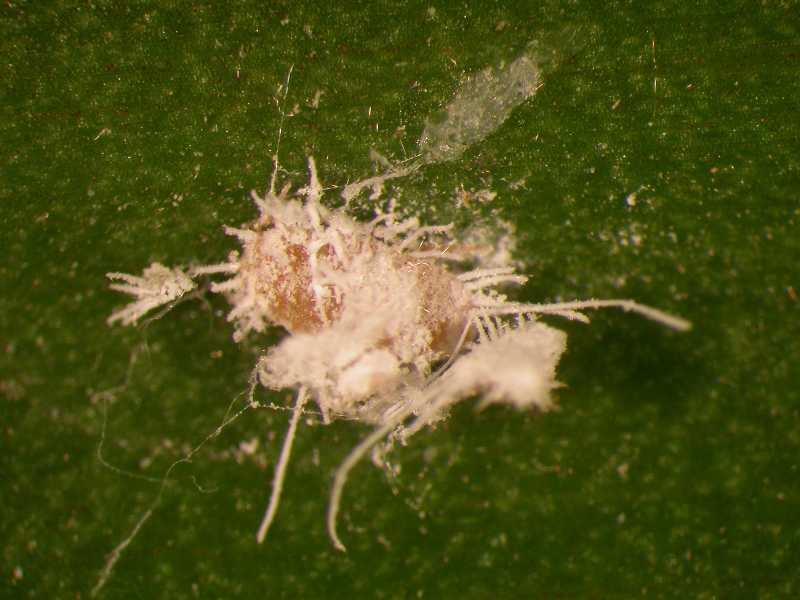 Mealybugs are common pests of indoor plants. 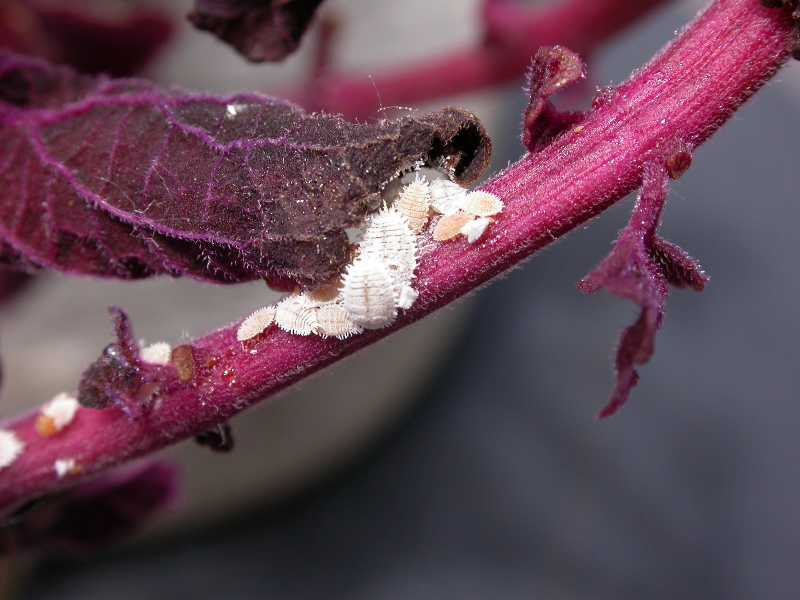 They can also be serious pests of outdoor plants in warmer climates, such as Florida and California. 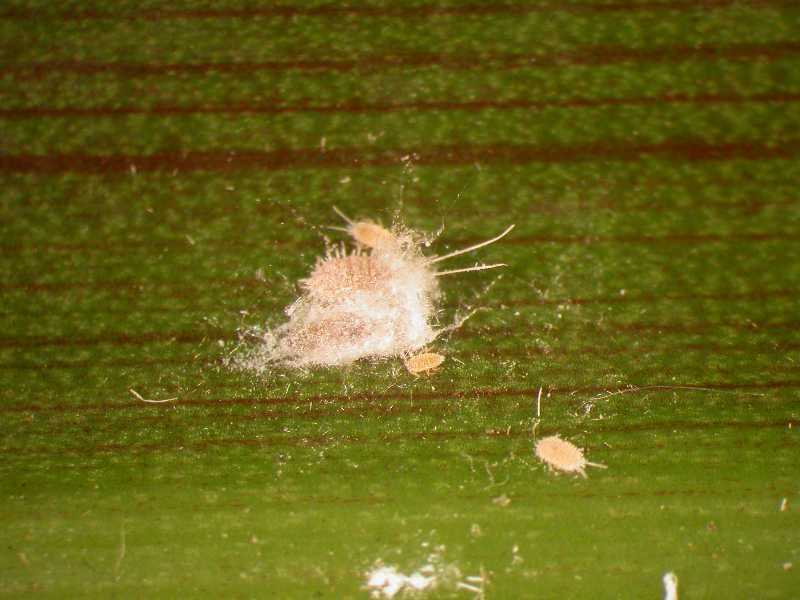 Adult females are oval, 1/5 to 1/3 inch long, and have a waxy, white, cottony appearance. They are slow moving and usually are in clusters along leaf veins, on the underside of leaves, and in hidden areas at joints. They are piercing-sucking insects, which feed on plant sap. The insects exude a honeydew, which can cause leaves to become sticky. Ants may be attracted to the sweet liquid. 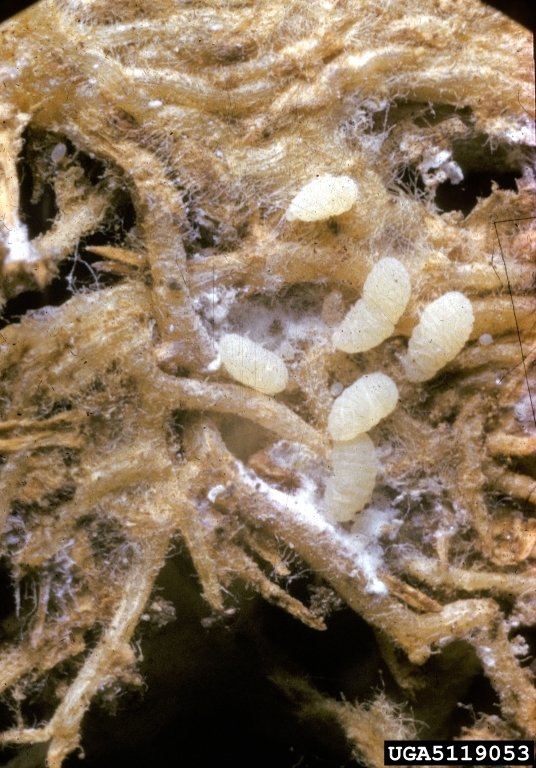 In time, a black mold, called sooty mold, can grow on the honeydew giving the leaves a dirty, sooty appearance. 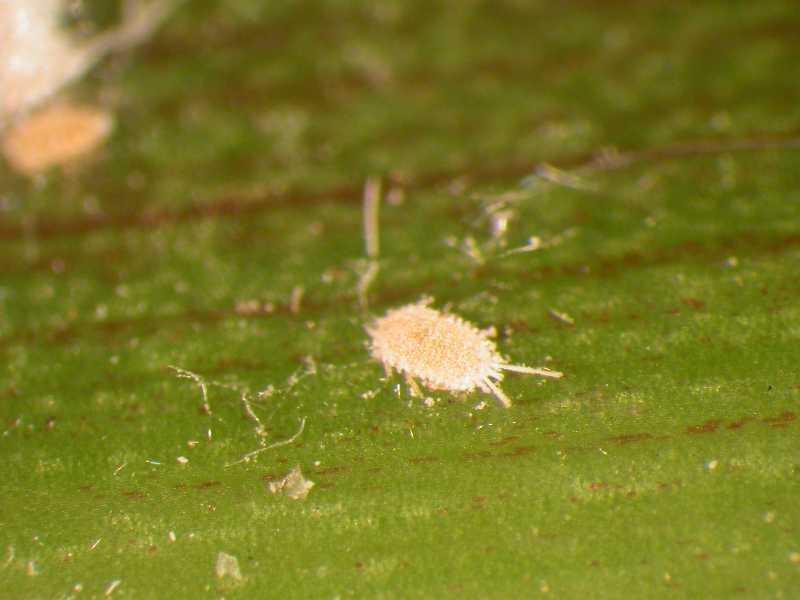 Plants infested with mealybugs become weak, may wilt and turn yellow, and eventually die. Indoors, eggs can be laid any time of year. Eggs hatch in about 2 weeks. The young mature in 6–8 weeks. Several generations can occur in the same year. 1. Remove insects. Dislodge as many insects as possible using a strong stream of water. A cotton swab soaked in rubbing alcohol will also effectively remove a few insects. 2. Use insecticidal soap. 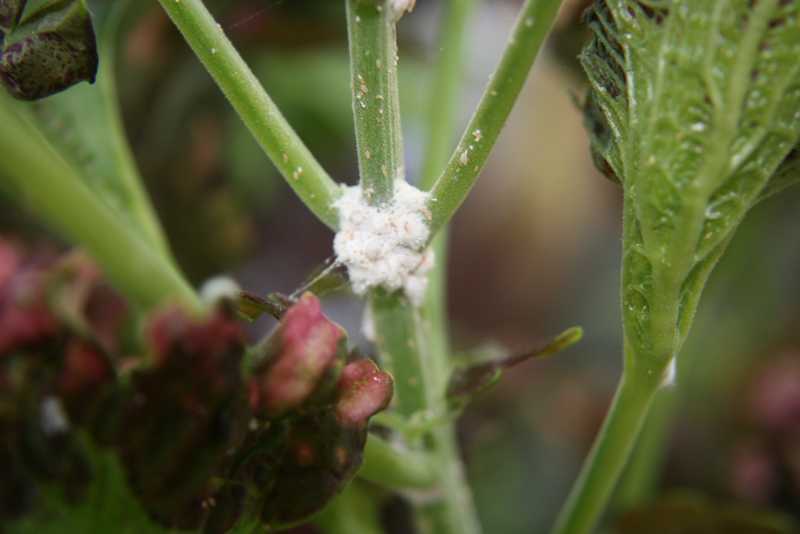 Insecticidal soaps specially formulated to kill insects and not damage plants are effective if used frequently until the problem is under control. 3. Use superior oil sprays. 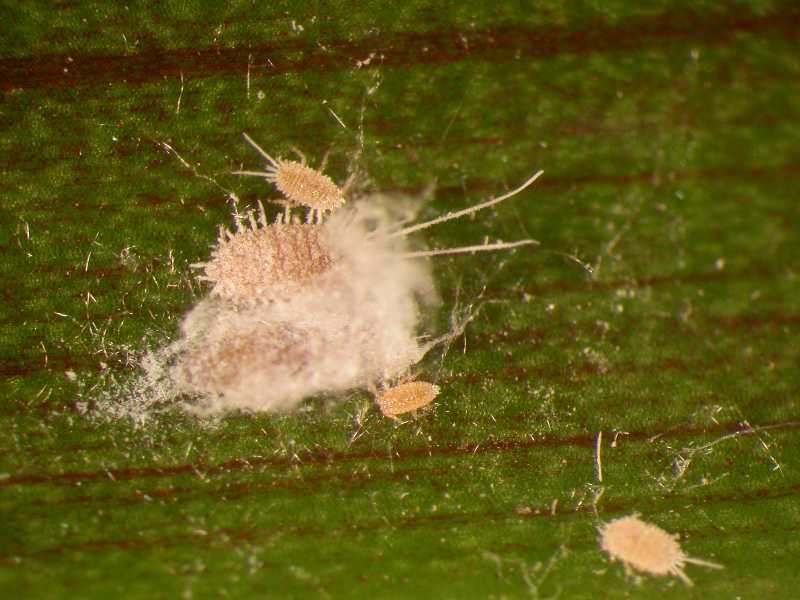 Highly refined oils sold as superior or horticultural oils are also very effective in controlling mealybugs. The oil suffocates the insects. Unlike dormant oils, these oils are highly refined and under proper conditions, can be applied to plants in foliage without damage. Follow label directions to avoid damage to some plants that may be sensitive. Superior oils are also considered nontoxic and are less likely to harm beneficial insects. When spraying indoors, protect surfaces that may be damaged by an oil residue. 4. Use chemical insecticides. Many insecticides registered for use indoors are available. Follow directions and, if possible, spray out-of-doors or in a garage, weather permitting. 5. To limit future problems, inspect plants regularly. With regular inspection, pest problems can be caught when just beginning and control is easier. It is also recommended to isolate newly acquired plants for 2–3 weeks to limit introducing pests indoors. Bringing plants indoors in the fall is another way of introducing insects indoors. Strategies 1 and 5 are strictly organic approaches. For an organic approach to Strategy 2, consult the Organic Materials Review Institute (OMRI™) for appropriate insecticidal soap products.